Twelve South’s newest Mac accessory is the HiRise for MacBook, a new stand for MacBooks from the 11-inch MacBook Air to the 15-inch MacBook Pro. It costs $69.99. The HiRise is height-adjustable up to six inches thanks to a spring-loaded stem, and is made from brushed metal. 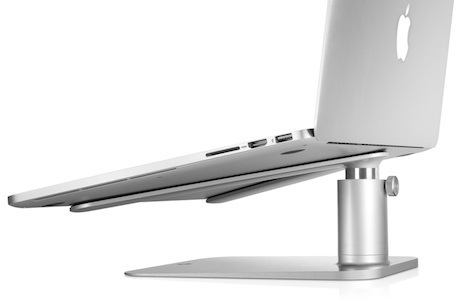 The laptop sits on a v-shaped arm equipped with soft silicone to keep it from getting scuffed. And teflon rails on the bottom also help your desk from getting marked up in the process. I’m a big fan of Twelve South’s products, I’ve got several of them and this one is going to be ordered shortly as well.